Audience: Appropriate for Pre-readers through age seven. I would use this book as a teaching tool with any elementary age, even a Confirmation class. 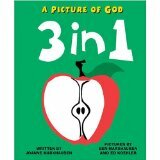 Summary: This lovely picture book explores the notion of how an apple is like the Trinity. Just as an apple has three distinct parts – the peel, the flesh and the core – there are three distinct aspects of the Trinity. Although the text is minimal, it is the bright illustrations that the drive the story. Illustrator Benjamin Marxhausen employs bright, mostly primary colors in his simple clean images of all things apple. The familiar images of apples lend to the telling of this story. Author Joanne Marxhausen writes in a clear and precise language. The familiar apple is a tool to open the mystery of the Trinity. The beauty of this book is it’s simple explanation of the triune nature of God. Literary elements at work in the story: The simple design of 3 in 1 is the beauty of this book. Generally, the layout follows a pattern of images and text describing attributes of an apple followed by images and text describing attributes of God. Each page has minimal text so that the eye is drawn to the illustration, such as a bright red apple with a single green leaf or a bright yellow circle on the facing page. Illustrative of this pattern, the book begins with a description and illustration of an apple as whole, followed by depiction God as one. Another example is the apple as three distinct parts followed by God as three distinct beings. The entire text is in bold capital letters. Some adult readers may find this distracting. I find it adds a silent significance to the story. (How) does the perspective on gender/race/culture/economics/ability make a difference to the story? The author consistently assigns the male gender to God. Those sensitive to gender-neutral depictions of God and the Trinity must be aware of this. Otherwise, myopia has blinded me. I see this story as a race/culture/economics/ability neutral. Theological conversation partners: The book invites conversations about the meaning of the Trinity. The stripped down analogy of how an apple is like the Trinity allows for basic understanding of very weighty theological issues. Because 3 in 1 is sublimely simple, it can be used as a teaching tool at many levels. a) Besides the apple in this story, can you think of something else that has three distinct parts, yet is one? b) The peel protects the rest of the tasty apple. Can you think of ways that God protects us? c) How can you plant a seed of faith in yourself? In other people? d) What are some ways you can make you faith grow big like an apple tree? e) The book tells us grown up faith is strong and bears healthy fruit, just like an apple tree. What are some of the fruits of a grown up faith? Did you know these are called Fruits of the Spirit? a) Read Jesus’ Great Commission, found in Matthew 28: 16-20. Do you recognize the three aspects of God here? b) Why would Jesus use this way of describing his own divinity at this time? d) Find a copy of both the Apostles Creed and the Nicene Creed. Do you recognize the three aspects of God in these creeds? Why is it so important for us to state this? Are these two creeds important to your individual faith? 3 in 1 (A Picture of God) by Storypath is licensed under a Creative Commons Attribution-NonCommercial 4.0 International License.